Actin has been implicated in many structural and motile functions in eukaryotes. Recent identification of actin-related proteins in bacteria extends the relevance of actin research to prokaryotes. Since actin is only known to function in its polymeric form, understanding how actin assembly is regulated is central to determining how it functions. Only in muscle cells, where the cytoskeleton is simple in organization and composition, are actin function and mechanism of action understood well. The dynamics and the complexity in function, composition, and organization of the actin cytoskeleton in nonmuscle cells make determining how actin functions a challenging problem. Many components of the nonmuscle cell actin cytoskeleton have been discovered and characterized biochemically, but how their activities are integrated to produce coherent cellular responses remains largely unknown . Studies on motility of intracellular pathogens and organelles in cell extracts are providing an important bridge between biochemistry and biology [2-4]. While these “open” systems make manipulation of individual proteins feasible, complex actin-based processes such as leading edge protrusion and endocytic internalization are difficult to study in extracts. Genetics provides an attractive approach for dissection of these actin-based processes in vivo. Actin cytoskeleton proteins are highly conserved, so principles from simple model organisms are expected to apply to more complex organisms. There is often a large gulf that separates in vitro and in vivo behaviors of actin cytoskeleton proteins, suggesting that some properties of living systems, such as regulation of actin monomer pools, may not be faithfully duplicated in reconstituted systems of pure proteins, or even in extracts. Actin subunits in filaments typically exchange with the monomer pool over 100 times faster in cells than is observed with pure actin in vitro at steady state . Also, in lamellipodia, barbed ends grow two orders of magnitude faster than is observed for pure actin at steady state in vitro . These results imply that the actin monomer concentration in cells is kept very high, likely in part through the action of proteins that regulate filament ends by terminating filament growth. Capping proteins insure that actin monomers are ‘funneled’ to uncapped filament ends to provide rapid assembly . Also, pointed end depolymerization is rate limiting with pure actin in vitro, but in cells is accelerated by cofilin . Proteins such as profilin can suppress spontaneous actin filament nucleation. Filament assembly therefore depends on uncapping or severing of existing filaments, or on nucleating factors that facilitate de novo filament assembly . The Arp2/3 complex and formins can provide such a nucleating activity [8-10], and their activators interface with signaling pathways that control cell motility and morphology . Reconstitution of Listeria motility from pure proteins was a remarkable demonstration of the functional capacity of complex mixtures of actin cytoskeleton proteins . However, inconsistencies between reconstitution experiments and in vivo results highlight the need for direct tests of in vivo functions and interactions . We are combining biochemistry, live cell imaging, and genetics to study actin dynamics. This combination of approaches provides a system of checks and balances, wherein each approach provides critical tests of conclusions reached using the other approaches. The yeast Saccharomyces cerevisiae is a particularly tractable organism for studies of the actin cytoskeleton. First, the sophisticated classical and molecular genetics of yeast provides the means to test function in vivo. Second, while yeast may not use actin for as many processes as more complex eukaryotes, this simplicity can facilitate both biochemical and genetic studies. For example, the fact that yeast has a single actin gene [14, 15], rather than the 6-20 actin genes present in most eukaryotes, has allowed the exploration of actin function through the isolation of recessive mutations in the actin gene itself (reviewed by ). Cofilin, profilin, and the 7 Arp2/3 complex subunits are also encoded by single copy genes. Until recently, it was assumed that the high rates of actin assembly and disassembly observed in motile cells were not possible in yeast, limiting the usefulness of yeast for studies of the dramatic actin filament dynamics typically associated with cell motility. However, our recent work, has shown that yeast cells have the capacity for highly dynamic actin assembly and turnover [17, 18]. The yeast actin cytoskeleton consists of three filament structures. Actin cables faciliate transport of vesicles, mRNAs and organelles to the growing bud, cortical patches are sites of endocytosis, and the contractile ring mediates cytokinesis [19, 20]. Each of these actin filament systems is composed of a distinct combination of proteins, and is regulated independently. S. cerevisiae cells grow by budding. As a bud emerges and grows, the cortical actin patches are associated with its surface. The proximity of endocytic actin patches to sites of growth may facilitate rapid exocytic/endocytic cycling, as these two processes are coupled [21, 22]. The actin cables are aligned along the axis of cell growth throughoutthe yeast cell cycle, where they are well positioned to mediate transport of cargo from the mother cell to the bud [19, 20]. Expression of green fluorescent protein (GFP) labeled cytoskeleton proteins in yeast demonstrated that cortical actin patches are highly dynamic structures [23, 24]. Our quantitative analysis of patch dynamics revealed a dynamic pathway for endocytic internalization  controlled by the Arp2/3 complex and its activators . Actin cables themselves undergo dynamic growth, and are nucleated by formin proteins located at the bud tip and bud neck [25, 26]. Figure 1. Changes in actin organization through the yeast cell cycle are highly choreographed. Throughout the cell cycle, actin is visible at cortical patches and in cables. At the start the cell cycle (top), actin structures are also enriched at the site where the new bud will emerge. Early in the budding process, actin assembly is largely polarized and endocytic sites are enriched in the developing bud. Later, as the bud becomes nearly as large as the mother, actin forms a contractile ring at the bud neck where cytokinesis will occur. A remarkable feature of the actin cytoskeleton in non-muscle cells is its dynamics. One consequence of the short half-life of actin filaments in vivo is that rapid changes in cytoskeleton organization can be achieved by small local changes in the rate of filament nucleation. Figure 2. Actin polymerization dynamics in vitro. Understanding assembly properties of pure actin is fundamental to determining how actin-binding proteins control assembly because these proteins modulate actin’s intrinsic assembly properties. In contrast to the assembly of tubulin into microtubules, where the concepts of “dynamic instability”  and “treadmilling”  describe filament behaviors in vivo, the detailed assembly and disassembly behaviors of actin filaments in vivo are not well understood. This is because, in contrast to microtubules, it is not possible to image individual actin filaments in real time in cells. However, recent use of Total Internal Reflection Fluorescence (TIRF) microscopy has at least allowed real time assembly behavior of individual actin filaments to be imaged in vitro, providing insights into likely in vivo dynamic behaviors . These in vitro studies, coupled with analysis of actin fluxes in live cells by photo-bleaching , photo-activation , and speckle microscopy , have resulted in detailed models for actin assembly and disassembly at the leading edge of migrating cells, and at the surface of projectiles moved by actin assembly forces . Briefly, actin filaments are nucleated near a membrane surface and grow from their barbed ends, which quickly become capped, terminating assembly. Subsequent to addition at filament ends, actin hydrolyzes its noncovalently-bound ATP to ADP and Pi [34, 35]. Actin-actin interactions in filaments are greatly weakened when Pi dissociates subsequent to nucleotide hydrolysis. This is because of a conformational change in the actin subunits. Significantly, because each subunit within the filament has the same orientation, the actin filament has a defined polarity. One consequence of ATP hydrolysis is that at steady state net subunit addition can occur at the “barbed” filament end, while net subunit dissociation occurs at the “pointed” end, resulting in a phenomenon called “treadmilling” . Determination of the rates of subunit exchange at the two filament ends, and the rates of ATP hydrolysis and Pi dissociation, have suggested that actin filaments might exist at steady state with ADP-actin at the pointed end, and ADP-Pi actin at the barbed end [37-39]. Treadmilling would occur when ADP-actin subunit loss from the pointed end is balanced by ATP-actin addition at the barbed end. Actin filament disassembly in vivo might be achieved by blocking new assembly at the barbed end by interaction with capping protein, and accelerating disassembly at the pointed end by cofilin . Regulated capping of filaments by Pi and/or capping proteins may allow growing, non-growing, and shrinking actin filaments to co-exist in the cytoplasm. Filament-severing proteins likely increase filament turnover by creating more filament ends. The severing protein cofilin acts preferentially on ADP actin filaments, suggesting that older filaments are favored for disassembly. As a result of the above considerations, important steps for regulation of filament assembly and stability include ATP hydolysis, Pi release, and ADP-ATP exchange on the monomer [40-41]. Since filament assembly must be controlled spatially, general mechanisms to suppress spontaneous filament nucleation while promoting localized nucleation must exist in cells. Localized activation of actin filament nucleation factors is likely to be a critical component of actin regulatory mechanisms. The most important advances in studies of actin dynamics in the last decade were discovery of the Arp2/3 complex and formins as key nucleators of actin filament assembly [10, 42]. Because nucleation is rate limiting for actin polymerization, regulation of this step controls when and where actin is assembled in cells. An important nucleator of actin filaments is the Arp2/3 complex, a seven-subunit complex that includes two actin-related proteins (Arp), Arp2 and Arp3. The Arp2/3 complex nucleates actin filaments de novo, and from the sides of pre-existing filaments, generating a branched filament array resembling those observed at the leading edge of certain motile cells [43, 10]. Arp2/3 activators, also known as nucleation promoting factors (NPFs), such as members of the Wiskott Aldrich Syndrome Protein (WASp)-family of proteins, activate Arp2/3 complex nucleation activity, allowing spatially regulated actin assembly that can generate forces in cells . Elucidating the mechanisms that regulate Arp2/3 complex function is essential for understanding the dynamics of actin-based force generation. Nucleotide binding plays a critical role in regulating actin dynamics. ATP binding by actin promotes actin filament assembly by closing the nucleotide-binding cleft [44, 45]. ATP hydrolysis and Pi release then results in a transition from the “closed” to the “open” state, promoting actin filament disassembly. Similarly, both Arp2 and Arp3 bind ATP, and the Arp2/3 complex requires ATP for nucleation [46, 47]. Hydrolysis of ATP by Arp2 has been linked to both the dissociation of actin filament branches , and to nucleation . In the crystal structure of nucleotide-free Arp2/3 complex, the Arp2 and Arp3 nucleotide-binding pockets resemble that of actin in the “open” conformation . Thus, ATP binding may close the nucleotide-binding pockets of Arp2 and Arp3 such that they can serve as a nucleus for actin polymerization. In addition to regulating the association of the Arp2/3 complex with actin, nucleotide binding by the Arp2/3 complex affects NPF binding. ATP-bound Arp2/3 complex exhibits a higher affinity for NPFs than ADP-bound complex . Furthermore, ATP binding by Arp2 has been reported to be enhanced by NPFs, and to be required for efficient Arp2/3 complex activation . Similar to nucleotide, actin filaments also enhance the Arp2/3 complex’s affinity for NPFs . Because Arp2 and Arp3 are splayed apart in the crystal structure of the inactive Arp2/3 complex , it is possible that the cooperative binding of ATP, NPFs, and actin filaments brings Arp2 and Arp3 together to form a template dimer for nucleation. Cryo-electron microscopy of the Arp2/3 complex in actin filament branches revealed that a large conformational change in the Arp2/3 complex represented in the crystal model is required for Arp2/3 activation . These conformational changes are likely to be influenced by the nucleotide state of Arp2 and Arp3. While nucleotide has been demonstrated to be important for nucleation activity of the Arp2/3 complex in vitro, the contributions of ATP-bound Arp2 or Arp3 to in vitro and in vivo function have not been determined for each protein individually. The fact that actin, Arp2, and Arp3 each bind to ATP complicates analysis of the contribution of nucleotide binding to the function of each individual protein. Our approach to this problem is to make mutants in the nucleotide-binding pockets of these proteins. Numerous actin-binding proteins are expressed in nonmuscle cells where they impart functional and structural diversity to actin polymers  and regulate the assembly/disassembly cycle. Actin-binding proteins can exert forces on actin filaments (myosins), cross-link or sever filaments, modulate actin subunit exchange by binding to filament ends, block or enhance assembly by binding to actin monomers, promote depolymerization, and they can suppress or stimulate nucleotide exchange on the monomer, thus controlling the assembly-disassembly steady state. 1. Ayscough, K.A., In vivo functions of actin-binding proteins. Curr. Opin. Cell Biol., 1998. 13(8): p. 927-930. 2. Welch, M.D., J. Rosenblatt, J. Skoble, D.A. Portnoy, and T.J. Mitchison, Interaction of human Arp2/3 complex and the Listeria monocytogenes ActA protein in actin filament nucleation. Science, 1998. 281(5373): p. 105-8. 3. Ma, L., R. Rohatgi, and M.W. Kirschner, The Arp2/3 complex mediates actin polymerization induced by the small GTP-binding protein Cdc42. Proceedings of the National Academy of Sciences of the United States of America, 1998. 95(26): p. 15362-7. 4. Taunton, J., B.A. Rowning, M.L. Coughlin, M. Wu, R.T. Moon, T.J. Mitchison, and C.A. Larabell, Actin-dependent propulsion of endosomes and lysosomes by recruitment of N-WASP. Journal of Cell Biology, 2000. 148(3): p. 519-30. 5. Pantaloni, D., C. Le Clainche, and M.F. Carlier, Mechanism of actin-based motility. Science, 2001. 292(5521): p. 1502-6. 6. Lappalainen, P. and D.G. Drubin, Cofilin promotes rapid actin filament turnover in vivo. Nature, 1997. 388: p. 78-82. 7. Condeelis, J., How is actin polymerization nucleated in vivo? Trends in Cell Biology, 2001. 11(7): p. 288-93. 8. Welch, M.D., A. Iwamatsu, and T.J. Mitchison, Actin polymerization is induced by Arp2/3 protein complex at the surface of Listeria monocytogenes. Nature, 1997. 385(6613): p. 265-9. 9. Mullins, R.D., J.F. Kelleher, J. Xu, and T.D. Pollard, Arp2/3 complex from Acanthamoeba binds profilin, nucleates polymerization of actin and crosslinks actin filaments. Mol. Biol. Cell, 1998. 9:841-52. 10. Welch, M.D. and R.D. Mullins, Cellular control of actin nucleation. Annu Rev Cell Dev Biol, 2002. 18: p. 247-88. 11. Millard, T.H., S.J. Sharp, and L.M. 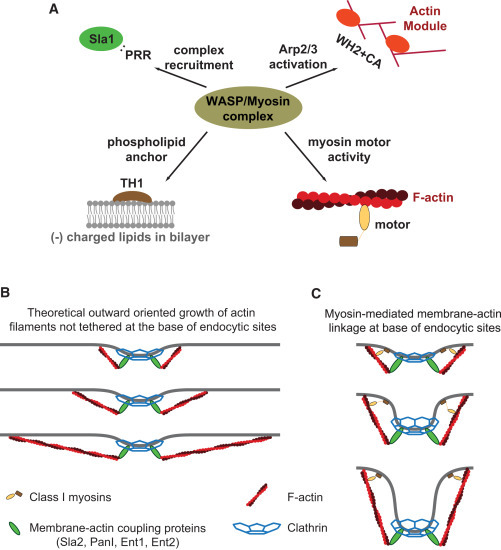 Machesky, Signalling to actin assembly via the WASP (Wiskott-Aldrich syndrome protein)-family proteins and the Arp2/3 complex. Biochem J, 2004. 380(Pt 1): p. 1-17. 12. Loisel, T.P., R. Boujemaa, D. Pantaloni, and M.F. Carlier, Reconstitution of actin-based motility of Listeria and Shigella using pure proteins. Nature, 1999. 401(6753): p. 613-6. 13. Skoble, J., V. Auerbuch, E.D. Goley, M.D. Welch, and D.A. Portnoy, Pivotal role of VASP in Arp2/3 complex-mediated actin nucleation, actin branch-formation, and Listeria monocytogenes motility. Journal of Cell Biology, 2001. 155(1): p. 89-100. 14. Gallwitz, D. and R. Seidel, Molecular cloning of the actin gene from yeast Saccharomyces cerevisiae. Nucl. Acids Res. , 1980. 8: p. 1043-1059. 15. Ng, R. and J. Abelson, Isolation of the gene for actin in Saccharomyces cerevisiae. Proc. Natl. Acad. Sci. USA, 1980. 77: p. 3912-3916. 16. Ayscough, K. and D.G. Drubin, Actin: general principles from studies in yeast. Ann. Rev. Cell Dev. Biol., 1996. 12: p. 129-160. 17. Kaksonen, M., C.P. Toret, and D.G. Drubin, A modular design for the clathrin- and actin- mediated endocytosis machinery. Cell, 2005. 123:305-320. 18. Kaksonen, M., Y. Sun, and D.G. Drubin, A pathway for association of receptors, adaptors, and actin during endocytic internalization. Cell, 2003. 115(4): p. 475-87. 19. Pruyne, D. and A. Bretscher, Polarization of cell growth in yeast. I. Establishment and maintenance of polarity states. Journal of Cell Science, 2000. 113(Pt 3)(6799): p. 365-75. 20. Pruyne, D. and A. Bretscher, Polarization of cell growth in yeast. Journal of Cell Science, 2000. 113(Pt 4)(6799): p. 571-85. 21. Kubler, E. and H. Riezman, Actin and fimbrin are required for the internalization step of endocytosis in yeast. Embo J, 1993. 12(7): p. 2855-62. 22. Geli, M.I. and H. Riezman, Endocytic internalization in yeast and animal cells: similar and different. J Cell Sci, 1998. 111 ( Pt 8): p. 1031-7. 23. Doyle, T. and D. Botstein, Movement of yeast cortical actin cytoskeleton visualized in vivo. Proc. Natl. Acad. Sci. USA, 1996. 93: p. 3886-3891. 24. Waddle, J.A., T.S. Karpova, R.H. Waterston, and J.A. Cooper, Movement of cortical actin patches in yeast. J. Cell Biol., 1996. 132: p. 871-870. 25. Yang, H.C. and L.A. Pon, Actin cable dynamics in budding yeast. Proc Natl Acad Sci U S A, 2002. 99(2): p. 751-6. 26. Pruyne, D., L. Gao, E. Bi, and A. Bretscher, Stable and dynamic axes of polarity use distinct formin isoforms in budding yeast. Mol Biol Cell, 2004. 15(11): p. 4971-89. 27. Mitchison, T. and M.W. Kirschner, Dynamic instability of microtubule growth. Nature, 1984. 312: p. 237-242. 28. Shaw, S.L., R. Kamyar, and D.W. Ehrhardt, Sustained microtubule treadmilling in Arabidopsis cortical arrays. Science, 2003. 300(5626): p. 1715-8. 29. Amann, K.J. and T.D. Pollard, Direct real-time observation of actin filament branching mediated by Arp2/3 complex using total internal reflection fluorescence microscopy. Proc Natl Acad Sci U S A, 2001. 98(26): p. 15009-13. 30. Wang, Y.L., Mobility of filamentous actin in living cytoplasm. J Cell Biol, 1987. 31. Theriot, J.A. and T.J. Mitchison, Actin microfilament dynamics in locomoting cells. Nature, 1991. 352(6331): p. 126-31. 32. Ponti, A., A. Matov, M. Adams, S. Gupton, C.M. Waterman-Storer, and G. Danuser, Periodic patterns of actin turnover in lamellipodia and lamellae of migrating epithelial cells analyzed by Quantitative Fluorescent Speckle Microscopy. Biophys J, 2005. 33. Pollard, T.D. and G.G. Borisy, Cellular motility driven by assembly and disassembly of actin filaments. Cell, 2003. 112(4): p. 453-65. 34. Carlier, M.F., D. Pantaloni, and E.D. Korn, Evidence for an ATP cap at the ends of actin filaments and its regulation of the F-actin steady state. J. Biol. Chem., 1984. 259: p. 9983-9986. 35. Carlier, M.F. and D. Pantaloni, Direct evidence for ADP-Pi-F-actin as the major intermediate in ATP-actin polymerization. Rate of dissociation of Pi from actin filaments. Biochemistry, 1986. 25(24): p. 7789-92. 36. Wegner, A., Head to tail polymerization of actin. J. Mol. Biol., 1976. 108: p. 139-150. 37. Korn, E.D., M.F. Carlier, and D. Pantaloni, Actin polymerization and ATP hydrolysis. Science, 1987. 238(4827): p. 638-44. 38. Pantaloni, D., T.L. Hill, M.F. Carlier, and E.D. Korn, A model for actin polymerization and the kinetic effects of ATP hydrolysis. Proc. Natl. Acad. Sci. USA, 1985. 82: p. 7207-7211. 39. Pollard, T.D., Rate constants for the reactions of ATP and ADP actin with the ends of actin filaments. J. Cell Biol., 1986. 103: p. 2747-2754. 40. Fechheimer, M. and S.H. Zigmond, Focusing on unpolymerized actin. J. Cell Biol., 1993. 123: p. 1-5. 41. Goldschmidt, C.P., M.I. Furman, D. Wachsstock, D. Safer, V.T. Nachmias, and T.D. Pollard, The control of actin nucleotide exchange by thymosin beta 4 and profilin. A potential regulatory mechanism for actin polymerization in cells. Mol Biol Cell, 1992. 3(9): p. 1015-24. 42. Higgs, H.N., Formin proteins: a domain-based approach. Trends Biochem Sci, 2005. 30(6): p. 342-53. 43. Svitkina, T.M. and G.G. Borisy, Arp2/3 complex and actin depolymerizing factor/cofilin in dendritic organization and treadmilling of actin filament array in lamellipodia. J Cell Biol, 1999. 145(5): p. 1009-26. 44. Belmont, L.D., A. Orlova, D.G. Drubin, and E.H. Egelman, A change in actin conformation associated with filament instability after Pi release. Proceedings of the National Academy of Sciences of the United States of America, 1999. 96(1): p. 29-34. 45. Sablin, E.P., J.F. Dawson, M.S. VanLoock, J.A. Spudich, E.H. Egelman, and R.J. Fletterick, How does ATP hydrolysis control actin’s associations? Proc Natl Acad Sci U S A, 2002. 99(17): p. 10945-7. 46. Dayel, M.J., E.A. Holleran, and R.D. Mullins, Arp2/3 complex requires hydrolyzable ATP for nucleation of new actin filaments. Proc Natl Acad Sci U S A, 2001. 98(26): p. 14871-6. 47. Le Clainche, C., D. Didry, M.F. Carlier, and D. Pantaloni, Activation of Arp2/3 complex is linked to WASp-dependent binding of ATP to Arp2. J. Biol. Chem., 2001. 276:466689-92. 48. Le Clainche, C., D. Pantaloni, and M.F. Carlier, ATP hydrolysis on actin-related protein 2/3 complex causes debranching of dendritic actin arrays. Proc Natl Acad Sci U S A, 2003. 100(11): p. 6337-42. 49. Dayel, M.J. and R.D. Mullins, Activation of Arp2/3 complex: addition of the first subunit of the new filament by a WASP protein triggers rapid ATP hydrolysis on Arp2. PLoS Biol, 2004. 2(4): p. E91. 50. Robinson, R.C., K. Turbedsky, D.A. Kaiser, J.B. Marchand, H.N. Higgs, S. Choe, and T.D. Pollard, Crystal structure of Arp2/3 complex. Science, 2001. 294(5547): p. 1679-84. 51. Marchand, J.B., D.A. Kaiser, T.D. Pollard, and H.N. Higgs, Interaction of WASP/Scar proteins with actin and vertebrate Arp2/3 complex. Nature Cell Biology, 2001. 3(1): p. 76-82. 52. Volkmann, N., K.J. Amann, S. Stoilova-McPhie, C. Egile, D.C. Winter, L. Hazelwood, J.E. Heuser, R. Li, T.D. Pollard, and D. Hanein, Structure of Arp2/3 complex in its activated state and in actin filament branch junctions. Science, 2001. 293(5539): p. 2456-9.